The key to a good, no strike that, great hair day when you have curls or waves is proper styling. It makes your texture pop & heads turn. It keeps you from needing to wash it too often and complaining about poofiness and frizz. 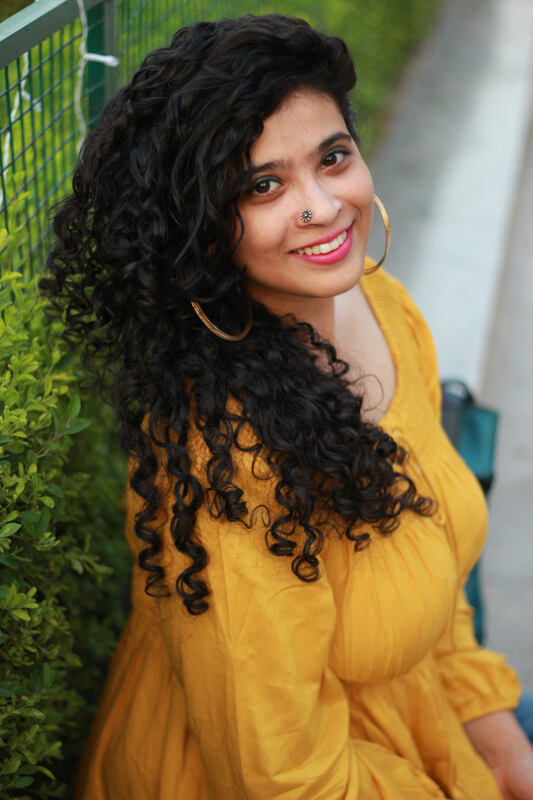 Read on to discover my ultimate guide to styling wavy curly hair with more than 15 different techniques! 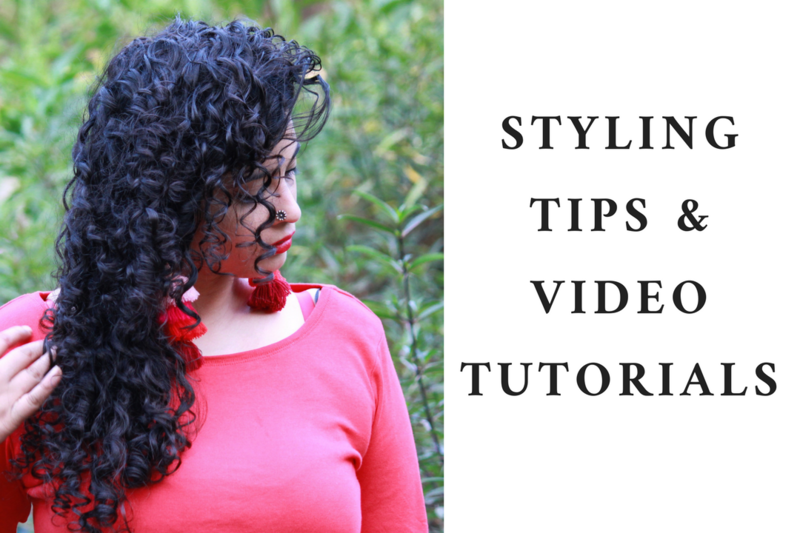 Over the years spent in the curly hair universe on Naturally Curly, YouTube etc, I have found that there is no ONE perfect way to style curly or wavy hair. With different hair types, density, porosity & thickness, YOU need to find what suits your own texture. So don’t get too caught up in one technique & feel disappointed when it doesn’t work out. Look below for a thorough primer on different techniques wavy & curly hair people across the world use to style & try them out a couple of times! You never know which one might suit you the best. 🙂 As for my readers who have asked how I style my curls, I have also included a video tutorial which you will find below under the Denman brush method. This is going to be a long post, so if you find yourself getting impatient, bookmark it & keep coming back to read it in chunks! A wavy or curly hair woman’s arsenal of products is often huge! Some of the items listed below however are optional, for e.g, I personally need a light, water based leave-in-conditioner, a curl cream AND gel for flawless curls (even while having low porosity curls) but many do just as well with one or two products. It is ESSENTIAL that you wash your hair well in the shower. Use a gentle shampoo (preferably CG Approved– free of sulphates, silicones & alcohol) to cleanse scalp & build-up from previous products or if you have stopped shampooing completely, use a conditioning cleanser (called co washing). It is best to detangle your curls gently with a good moisturising conditioner, first with your fingers & then a wide-toothed comb. Rinse off completely (what I do) or leave some in (in your hair, not the scalp). If you have wavy hair, I recommend you try this technique called Squish To Condish. And remember, make sure your hair is still wet when you get ready to style. Hands Away Approach – No touching until it dries fully & even then, avoid. You’ll encourage frizz. Ah, the meat of the article. I have listed all the methods I have seen on Youtube over the years & some I read recently in The Curl Revolution. Like I said earlier, different methods suit different wavy & curly heads or perhaps, even a combination of them. I have linked a video below each method which explains it best. Watch & try it a couple of times to see what works for you. Great for creating volume, bounce & definition. In this technique, you take sections of your hair in your palms and squeeze or crumple in an upward direction. You can either take your styler/leave in conditioner of your choice, rub it between your palms & then scrunch up the sections or take a tshirt & scrunch upwards after you have applied the products with another styling method. The latter is what I do. This is great if you’ve done Squish to Condish in the shower too. Take your leave in/styling product & rub it across your palms and smooth it over your strands from the top to the bottom, with hands clasped, as if in a prayer. I often use this while applying a gel to my curls. Section your hair to ensure even distribution. Take your leave in conditioner/ curl cream in your palms & rake it in, i.e, finger comb through the strands. Next, smooth the section next to encourage them to clump back together. Do the same with a gel if you include one in your routine. Asha has a great video on this so watch how she rakes in below. This is SO popular among Natural hair Youtubers! Especially 3 B/C & Type 4 textures since it increases length and gives a lot of definition to your curls. The best way to learn this is visually so watch the video below by Jewjewbee (one of my favs). If you have thin hair like me, you might like several tiny curl clumps instead of a few big ones. After applying my leave in, curl cream & gel with praying method, I rake in & then use my denman brush to comb through. You can also use a wide toothed comb (big clumps) and/or narrow comb (smaller clumps) to get similar results. Do note that using Denman has given me THE best definition till date. I found these listed separately in the book – The Curl Revolution by Naturally Curly but found no difference between them. The Rake & Shake, created by Ouidad is more popular though or perhaps more widely known and used amongst the curl world. In this, after Raking, you take a section between your finger and shake it in a left-right direction. Watch the video below by Curly Penny (she’s super hilarious) to understand better. Actually, any method to get the curl strands to form clumps is called clumping. If you want smaller clumps, use technique 5. If you want thicker clumps, wet your hair, either with a spray bottle or under a tap & then clump the sections together. I like how Mismmo, the owner of bounce curl does it- After applying her products, she take sections of her hair along the length in her fist & squeezes to form clumps. Remember what Squish to Condish is? Super Soaker is similar – the only difference is in STC you use a conditioner & is done during your hair wash & in SS you use your styling products & this is AFTER you’re finished washing! This is another styling method that I’ve heard great things about by people who have wavy hair. Anjana also has a very detailed post on this, you can learn more here: Super Soaker method for promoting curl clumps. I would LOVE to have the patience & time to do this. You can do this method throughout the entire hair or like me, to a few sections that refuse to curl like the rest (you know those sneaky ones!). Once your hair is wet, freshly styled with your products either with raking or combing through, take a small section of hair on your index finger & twirl it around till you reach the end. Continue doing this until every section is done. If a section gets dry by the time you come to it, simply re-wet it with a spray bottle. Finger coiling damp on dry hair won’t have the same result. There are several videos on this but the one below by Luhsetty is my favourite. A great way to encourage spirals, or change the structure especially in wavy hair, this technique needs to be done on wet, completely detangled hair. After applying your leave in, take a gel with strong hold & smooth it on a section. Twist the section around your finger, starting from the root, just like how we learnt in Finger Coiling above. Slide your finger down to the end & start ‘skipping’ the strand, the way you use a jump rope. After the strands have dried, you can SOTC (explained in another method below) & separate a few sections as desired. Another favourite in the wavy hair community & those with looser curl patterns! Here’s what you need to do – with wet hands, take half of what you would normally use of your styling products & rake it in on wet hair. Scrunch scrunch scrunch! Diffuse/Air Dry till curls or waves are 50% dry. Re-apply the remaining 50% of the styling product again with wet hands. Diffuse again till it’s fully dry! Remember to use wet hands since dry hands with sticky product will cause frizz & separate the strands. Liz recently tried this method with KCCC with great success. Also, check out this video by real life+curly girl below. I’ve only recently been led to her site & god, I LOVED her videos & tips! If you’re a wavy hair girl, do check out her channel as well! This method can be used in addition to any of the other methods. It is a great way to avoid a flat crown. You will need clips to simply pin the wonky strands on the top after styling. Once dried, you will see the clumps are not sticking to your scalp. Fluff your scalp once it’s dry & watch how big it looks after! This is done post styling when the curls have fully dried & they get a gel cast (your hair will feel little crunchy). To remove it, you simply take a tiny amount of oil in your palms and break the cast by scrunching upwards & fluffing out the scalp. Making your waves & curls last longer will save time, money AND reduce stress on your hair. It also allows your natural oils of your scalp to get restored. It’s entirely possible to have good hair days without having to wash it each time. Do remember that the no of days you go without washing is also dependent on your texture -wavier hair types tend to lose definition faster than curlier ones. AND, for most, wash days will always the best hair day – It’s just what it is & you shouldn’t worry too much otherwise. And done! I hope this guide helps you figure out the best way to style your naturally wavy or curly hair. Did I miss out any technique? Did I explain a method wrong? Let me know with a comment below or drop me an email & I’ll be happy to check it out and add it to the list! If you have more questions, you can also comment below or head on over to my Instagram, Facebook or Twitter. You can also ask me questions on my forum. I also have more videos on my Youtube channel. To properly understand my routine, do watch my tutorials & subscribe to my channel. If You Have Wavy Hair, You'll LOVE real life+curly girl's Top Tips! Yay! That was the whole point! Let me know which ones worked for you and which ones didn’t!